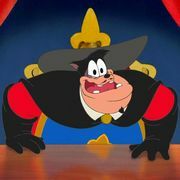 Movie transcript with snapshot pictures part 3 PETE: Lieutenant Clarabelle! 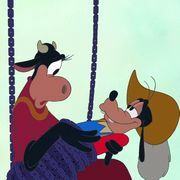 CLARABELLE: Oui, oui, mon capitaine. You bellowed? PETE: Throw these clowns into the pit! CLARABELLE: Oui, oui! Le pit! BEAGLE BOY 1: No! BEAGLE BOY 2: Not that! BEAGLE BOY 3: Anything but le pit! CLARABELLE: Bon voyage, losers. BEAGLE BOY 3: Not so bad. CLARABELLE: Bonjour. Pete's secret lair. Clarabelle speaking. The princess?! MUSKETEERS (SINGING): All for one / All men of honour, hear the call / Musketeers sing / All for one and one for all PETE: Your Highness. So glad you could grace us with your royal omnipresences. 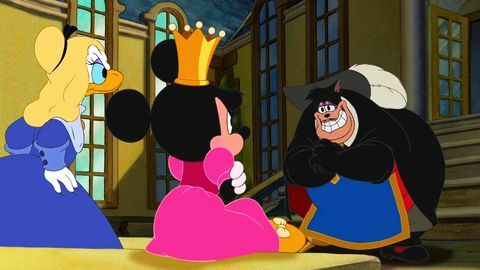 MINNIE: I want bodyguards DONALD DUCK: Oh, boy. MICKEY MOUSE: Hey, Donald. Don't worry about what Captain Pete said. Cheer up. I'm sure there's some way we can become musketeers. DONALD DUCK: We can? 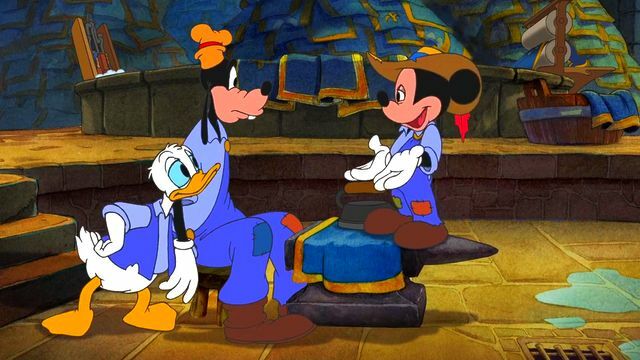 MICKEY MOUSE: Hey, Goof, you know we can prove Pete's wrong about us if we just work hard and stick together. 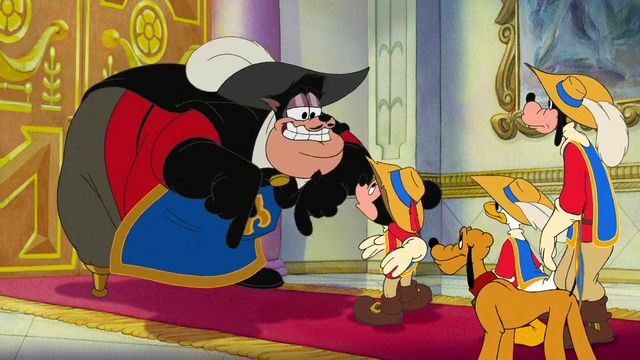 GOOFY:	You really think so? MICKEY MOUSE: Hey, have I ever let you down? Have I? Have I? Have I? GOOFY:	No. MICKEY MOUSE: Just imagine, guys. Maybe not today, maybe not tomorrow, but someday Captain Pete's gonna march in here and say: PETE: Congratulations, boys! You passed the test. I've been watching you three and I'll tell you what. You guys have got what it takes to be musketeers! MICKEY MOUSE: Really? You mean it? PETE: Cross my heart. MICKEY MOUSE: Oh, boy! Hey, fellas! We're gonna be musketeers! 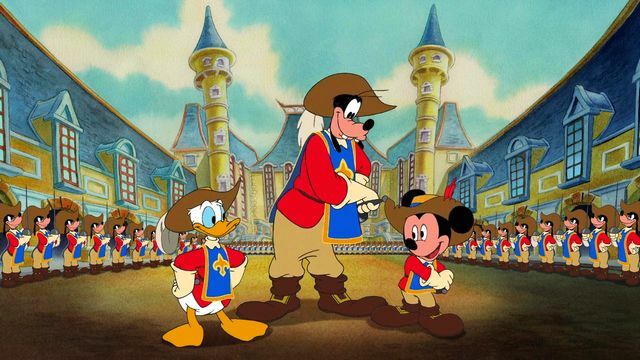 DONALD DUCK: Musketeers! 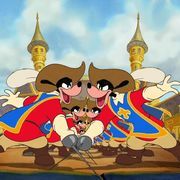 GOOFY:	Musketeers! 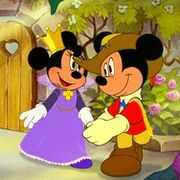 MICKEY MOUSE: I knew we had what it takes. GOOFY:	'Cause we're clever. DONALD DUCK: And brave. MICKEY MOUSE: And together we are gonna be great big heroes. What do you say, men? All for one. GOOFY:	And two for tea! MICKEY MOUSE: Well, we'll work on it. PETE: Hup, deux, trois, quatre. Hup, deux, trois, quatre. Hup, deux, trois, quatre. Hup, deux, trois, quatre. Company, halt! Stay here whilst I go schmooze Princess what's-her-name. MICKEY MOUSE: Wow. This is it, guys. This is what we've been waiting for all our lives. Now, when these doors open, we've got to make a great first impression. OK. Remember, fellas, we're on duty and this place could be crawling with bad guys. DONALD DUCK: Bad guys?! 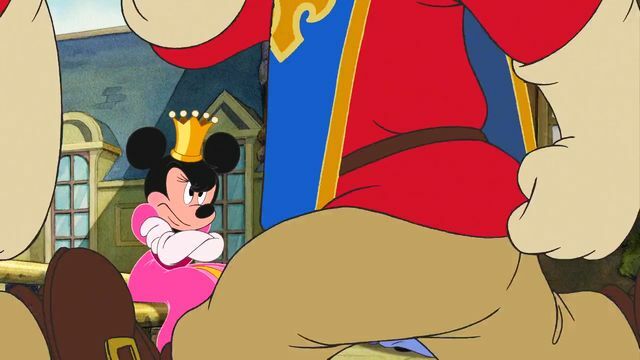 MICKEY MOUSE: So stay alert! DONALD DUCK: You heard him. Stay alert! GOOFY:	Aye, aye, sir. Bad guy! No! MICKEY MOUSE: Goofy! GOOFY:	Gosh. He pulled an ax on me. PETE: Your Royal Highness, I have never, ever had a more highly skilled group of gentlemen than the individuals which I present to you today. DAISY:	Seems like this is gonna take a while. I'll go get you a little snack. PETE: It took my highly trained eye to see their true potential. 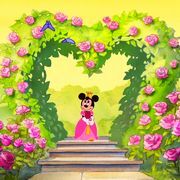 MINNIE: Yes. Well, France thanks you and your eye very much. 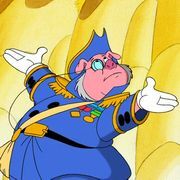 PETE: Well, then it is without further ado... that I present, for your complete safety and protection, your musketeers! MINNIE: Just imagine. He'll stride into the room. Light will glow from him. I'll hear music. He'll bring me flowers. And he'll sweep me off my feet. And I'll know he's the one when he makes me laugh. DAISY:	Your Majesty, it's time to cut the cheese. MINNIE: What? DAISY:	Here we are. Roquefort, anyone? GOOFY:	Knife! 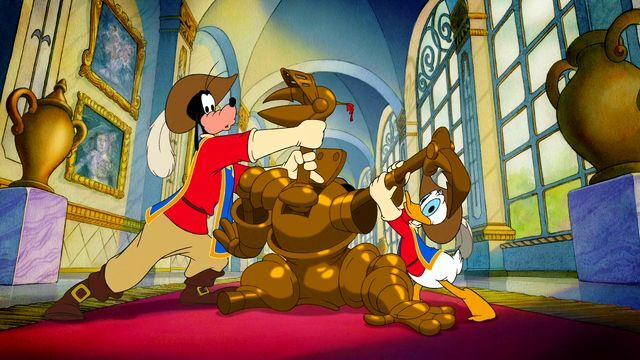 DONALD DUCK: Bad guy! 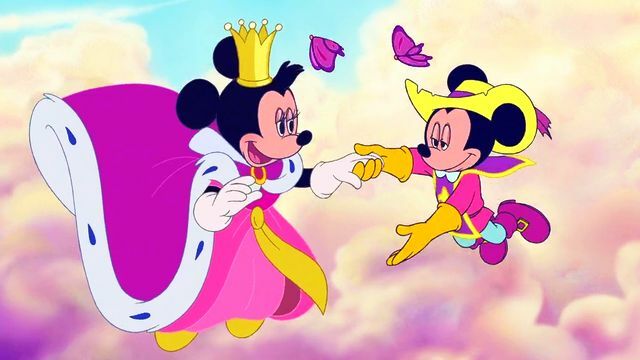 MICKEY MOUSE: Grab her! DAISY:	Oh, no. Help! MINNIE: Unhand her! Release her! Stop it! Drop her! She is my lady-in-waiting! 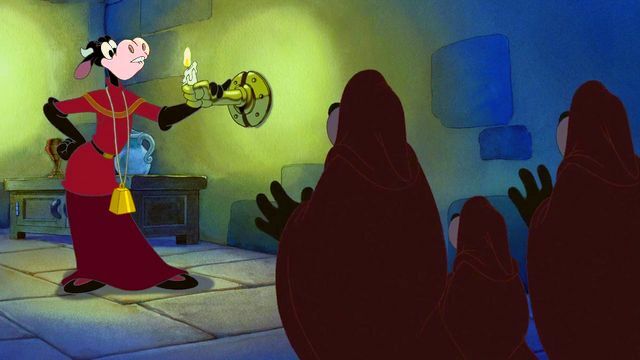 PETE: You'll have to forgive them, Your Highness. They're like a well-oiled machine, that's wound just a little too tight. 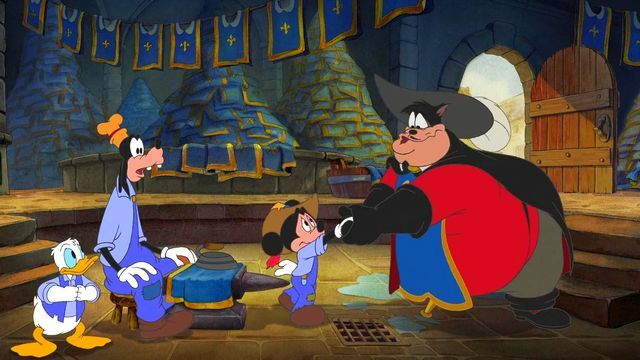 MICKEY MOUSE: We're sorry, Your Grace. We thought she was a villain. DAISY:	I don't think so. MINNIE: I see. Well, then, I feel safer already. TROUBADOUR: Oh, no. When the bad guy is that happy, it always, always means: Bad-guy song! PETE: Evening, trusted lieutenant. Watch out for the bricks. 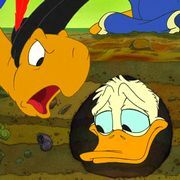 CLARABELLE: What? PETE: Why'd the music stop?